5A-106 - Xavear Cullors (26-19) place is unknown and scored 2.00 team points. 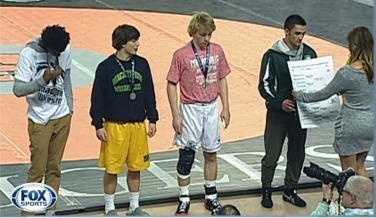 5A-113 - Gunner Hamm (8-12) place is unknown and scored 3.00 team points. 5A-126 - Nate Keim (39-10) placed 1st and scored 19.00 team points. 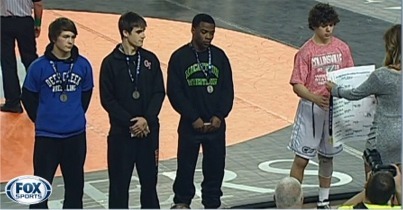 5A-132 - Justin Walker (28-11) placed 2nd and scored 14.00 team points. 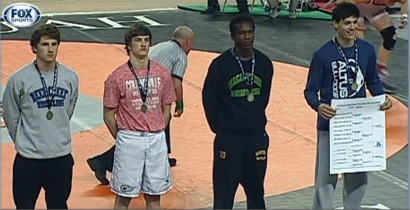 5A-145 - Elijah Tanner (44-5) placed 1st and scored 18.00 team points. 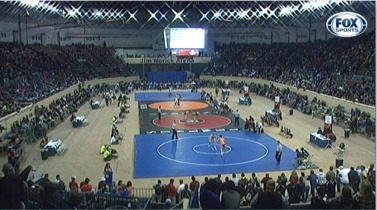 5A-152 - Wyatt Jordan (34-9) placed 1st and scored 23.00 team points. 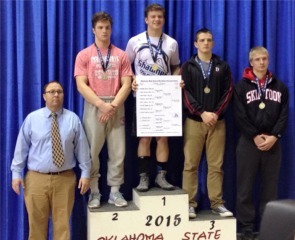 5A-160 - Ryan Haymaker (22-4) placed 3rd and scored 10.00 team points. 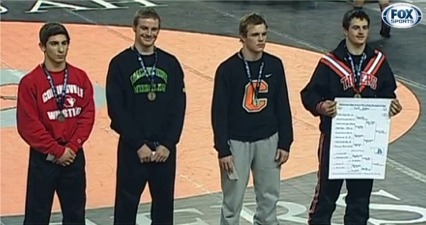 5A-170 - Josh Arnold (34-17) placed 4th and scored 7.00 team points. 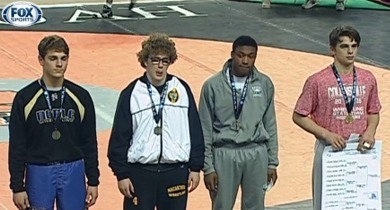 5A-195 - Roc Robbins (39-7) placed 2nd and scored 16.00 team points. 5A-220 - Justin Kothe (14-17) place is unknown and scored 0.00 team points. Haymaker Photo -- (L-R): Justin Walker, Roc Robbins, Xavear Cullors, Christian Moody, Nate Keim, Ryan Haymaker, Elijah Tanner, Wyatt Jordan, Justin Kothe, Josh Arnold, Gunner Hamm. 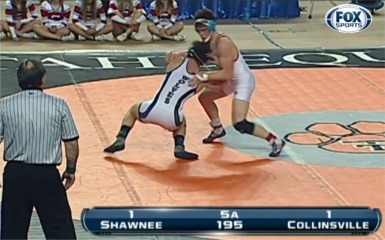 Nate Keim won 1-0 in the finals -vs- Shawnee for the 5A State Title at 126 pounds. Eli Tanner is State Champ at 145 with a flurry in the final half minute for a 2-1 win over Glenpool. 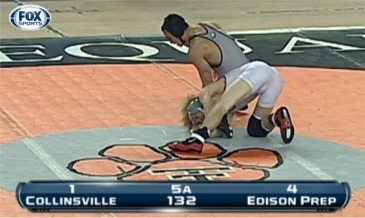 Wyatt Jordan got a fall at 152 for the State Title -vs- his Edison opponent in the finals. Roc Robbins lost 2-3 in the 3rd overtime period for the runner-up spot at 195 -vs- an undefeated Smith from Shawnee. 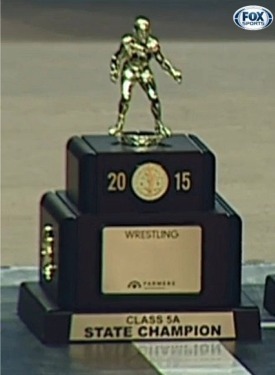 Wrestling Cards Are 5 Time State Champs (Team) + State Titles for Keim, Tanner, Jordan. 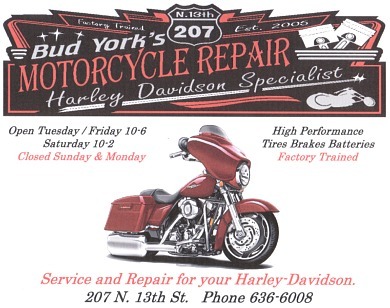 RunnerUps: Walker & Robbins, Haymaker 3rd & Arnold 4th-- Ted 7:45pm Sat. 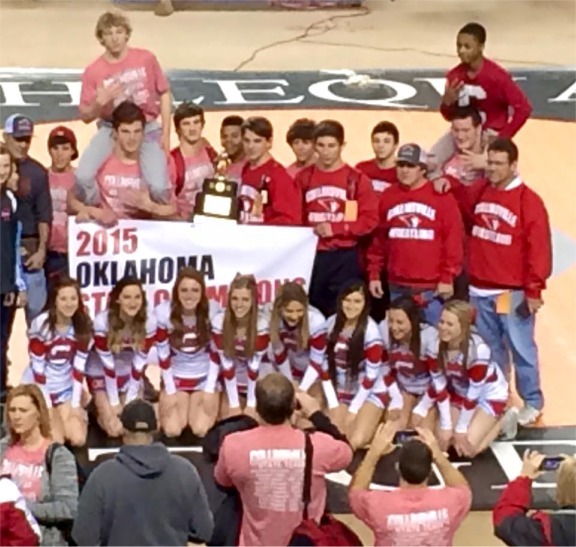 In a season where they lost one of their best and most dominating wrestlers (two time State Champion Christian Moody), lost a dual to 5A team, and finished 2nd in regionals it looked like the Cardinals run of State Championships might come to an end. 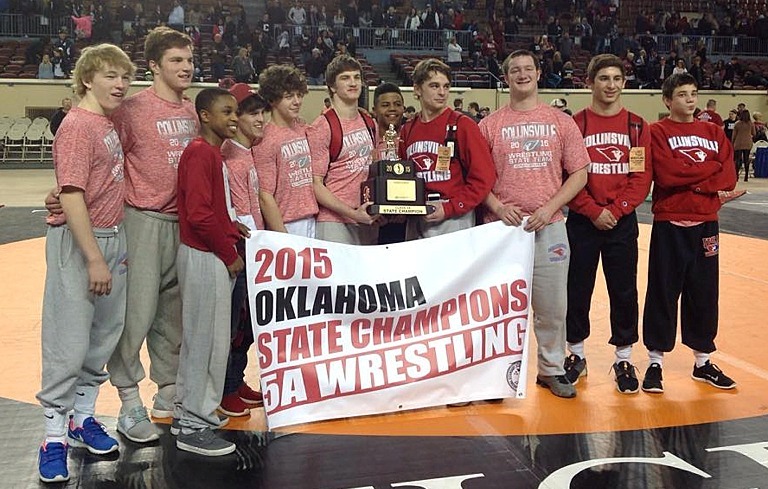 However, like we saw at Dual State two weeks ago, the Collinsville Cardinal Wrestling team showed the heart of a champion and came up big in the State Tournament this weekend and won their 5th straight Class 5A Team Title. They put 5 in the finals and placed 7 to outscore Regional Champion Coweta 112 to 103.5. Winning State Titles for the Cards were Nate Keim, Elijah Tanner and Wyatt Jordan. Justin Walker and Roc Robbins finished 2nd while Ryan Haymaker placed 3rd and Josh Arnold finished 4th. 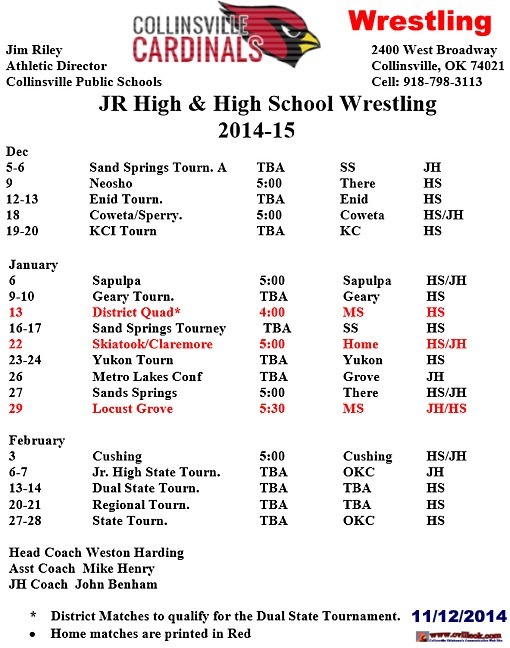 Collinsville started the final round 1.5 pts behind Coweta. By the time Keim and Tanner won their matches it was almost impossible for anyone to catch them and when Wyatt Jordan got a fall in his match the Cardinals could start the celebration of their 5th State Championship in a row. 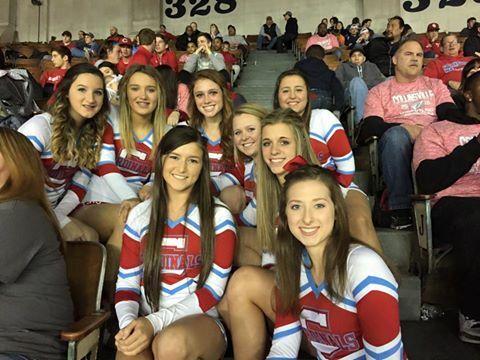 Congratulations to the Cardinal Wrestlers, Cardinal Cheerleaders, Coach Harding, Coach Henry and Coach Benham.